(Book). 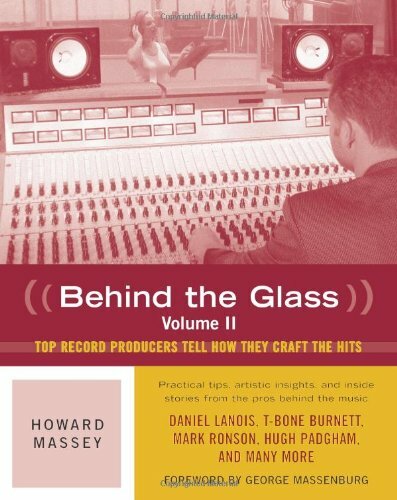 Behind the Glass, Volume II presents another prime collection of firsthand interviews with the world's top record producers and engineers, sharing their creative secrets and hit-making techniques from the practical to the artistic. In these pages you'll find Daniel Lanois (U2, Bob Dylan) discussing the future of digital recording; T-Bone Burnett (Robert Plant and Alison Krauss) sharing his unique view of creating complex low end; and Hugh Padgham (Police, Genesis) analyzing the state of the business today. For real-world advice on everything from home recording to mixing to coaching a nervous singer, check out author Howard Massey's conversations with Mark Ronson (Amy Winehouse), Tony Brown (Reba McEntire), Gus Dudgeon (Elton John), John Simon (The Band), Russ Titelman (Steve Winwood), Bruce Swedien (Michael Jackson), Rodney Jerkins (Mary J. Blige), Simon Climie (Eric Clapton), Matt Serletic (Matchbox Twenty), and more. If you have any questions about this product by Backbeat Books, contact us by completing and submitting the form below. If you are looking for a specif part number, please include it with your message.